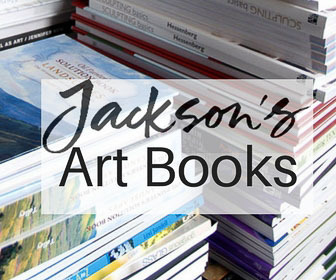 Or do artists just like to look at picture books? It is both of course. My book case is full of books to just leaf through and find inspiration in, as well as books on painting techniques, art theory and of course I have a lot of art history books. 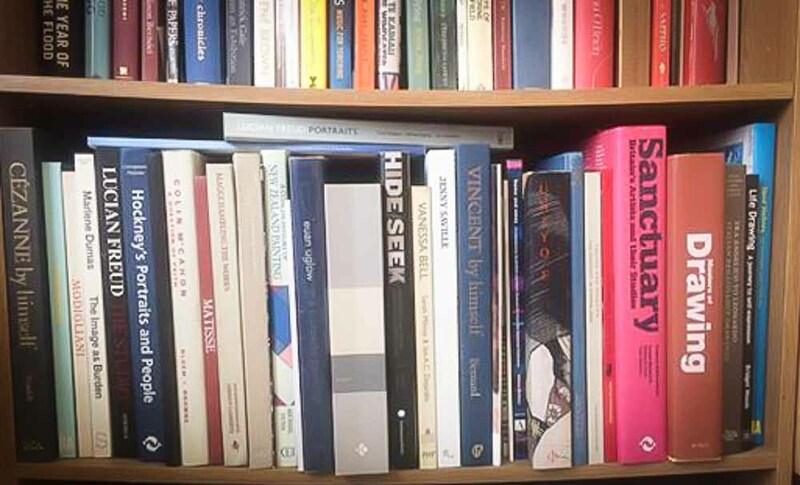 When a fellow artist recently posted a picture of his book case online I realised I did not have one single book in common with him. 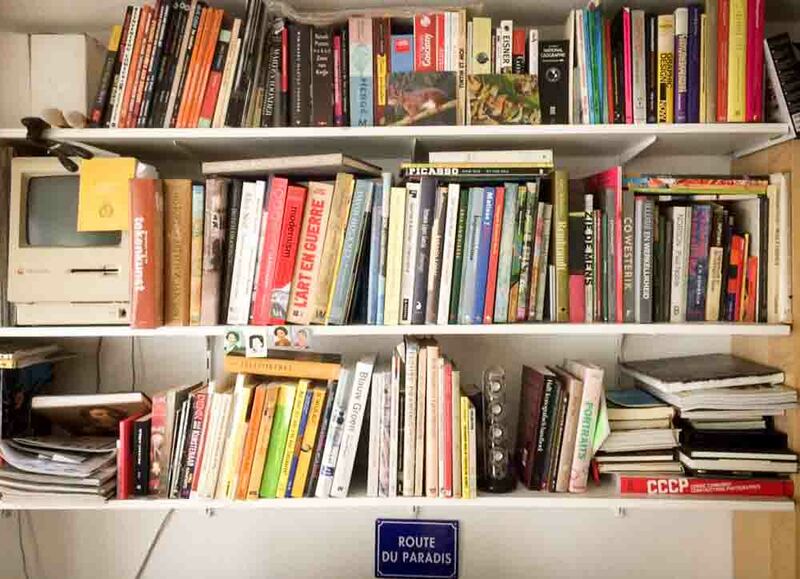 Amazed at this difference I asked my artist friends to share their book shelves with me and you all on this blog. 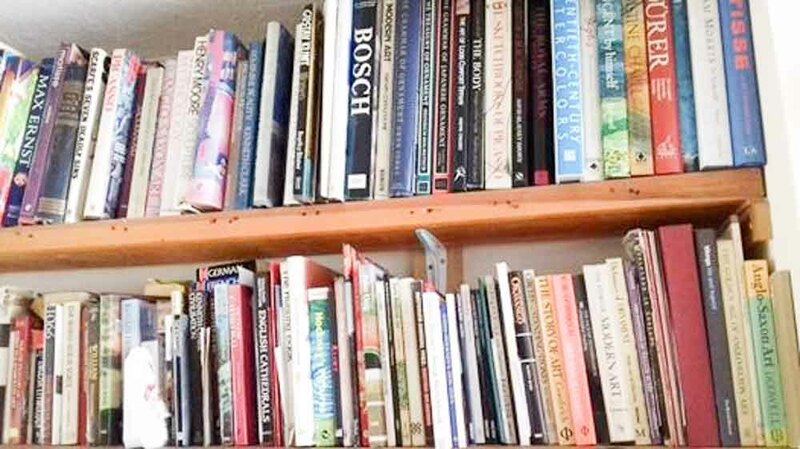 I am betting on the fact that we all peek into other people’s houses if we notice the curtains open; We can’t help but let our eyes wander over other people’s book cases. Or is it just me that has these (well hidden by good manners, honest) nosy tendencies? 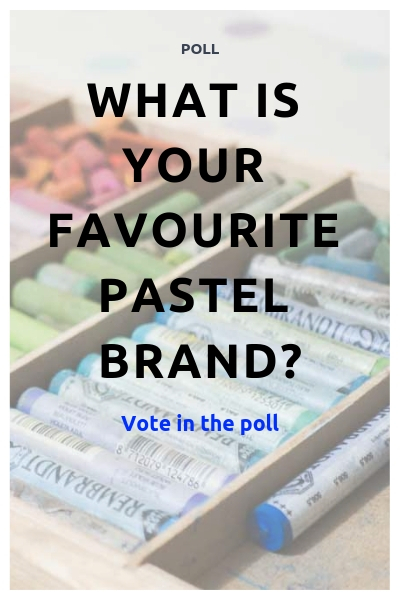 Do you guys also look for the stuff you like yourself? Go On, Have a Nose! Maureen Nathan‘s pile is very photogenic so she gets first place for aesthetics (see picture above). 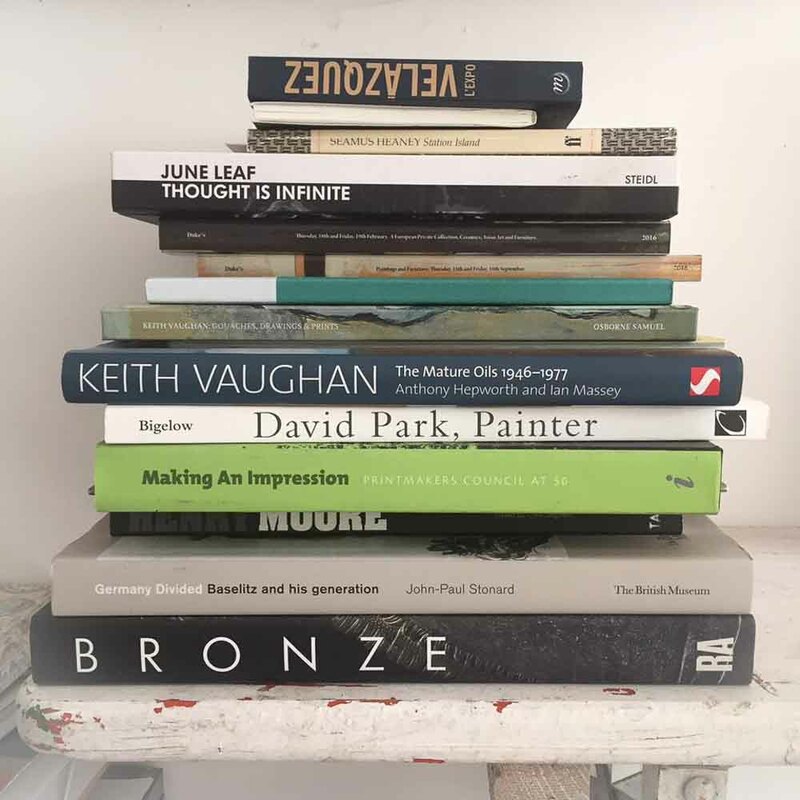 Some hefty exhibition catalogues and a preference for mid 20th century painters can be found in this pile. 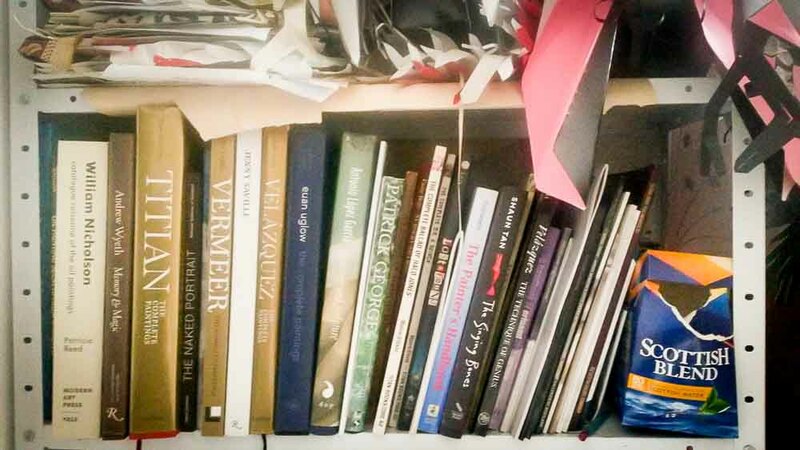 There is Keith Vaughan, David Park and as a nice touch a small book on Velazquez on top. 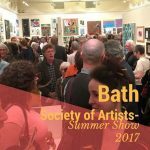 You can find traces of all of these artists in Maureen’s work. 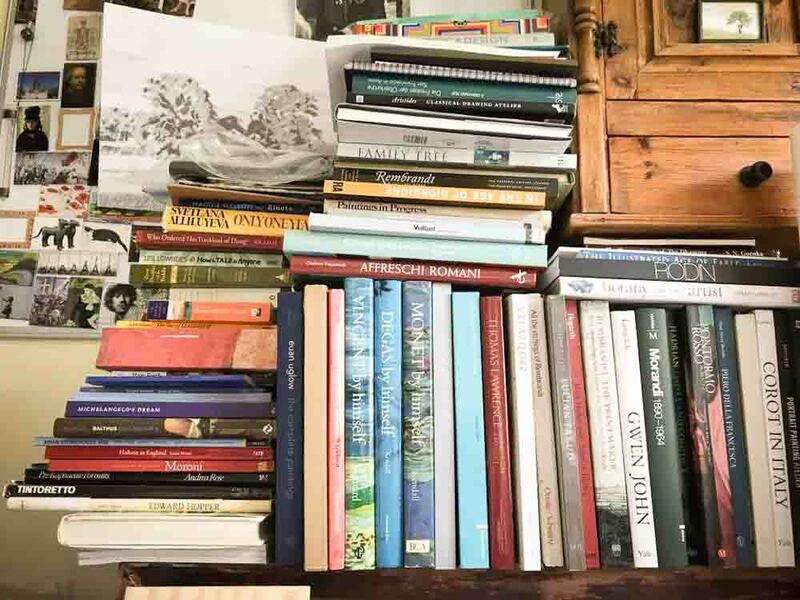 Jane Gardiner includes important things like a box of tea on her shelf. No, but seriously, she has some very impressive books on art history here. Again we find Velazques (twice), Vermeer, Titian, and Wyeth. Knowing Jane’s work these books make sense. Cherylene Dyer‘s shelf has a wonderful variety. 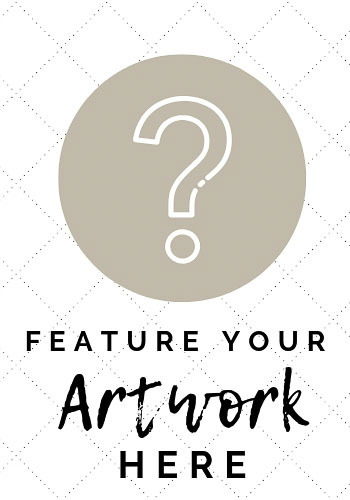 There is Caravaggio and Goya, Jenny Saville and realist painter Everett Shinn, Odd Nerdrum and Paula Rego. 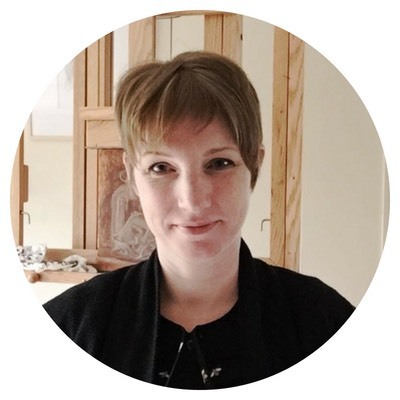 Interesting notes are “A Pictorial History of the Carousel”, and “Vile Bodies”…… Check out Cherylene’s work and you’ll see how all this fits. Kim Eleanor Stonehouse has given me a lovely arty picture with an overloaded book shelf, surrounded by pictures on the wall. There is a lot to see. Velazquez pops up again and some Rembrandt, Pontormo and Piero Della Francesco, Tintoretto and Leonardo. But there is a definite modern side as well. I can spot Freud, Diebenkorn and Uglow. Kim’s landscapes especially are very beautiful. Dutch artist Hans Verbeek has not only a fantastic antique computer (who remembers those floppy drives?!) but a great variety of books on art theory (I was intruiged by a book called “Blauw Groen” – Blue Green, on colour theory) as well as other more philosophical works. 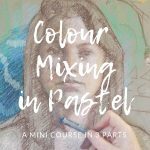 There is Picasso, Rembrandt and big volumes on art history, drawing and self portraiture. I also spotted a book on Goscinny on the top shelf…you know the guy who wrote the Asterix comics. Love that! Verbeek is a great draughtsman and portrait painter. Fab plein-air artist Roy Connelly also has a picturesque book shelf with a picture by Peter Brown (and various books on him too) and books neatly organised by size. A big book on plein-air landscape painter Eugene Boudin stands out amongst works on Ken Howard and lots of ehibition catalogues from the Royal Academy and the New English Art Club. Paul Finn spreads a selection of his books out for us and I cannot say I know any of these. It is amazing to see how little overlap there is amongst our book shelves. Looking up the names on the books gave me some new discoveries. Again the variety is large, with books on Corot, David Bomberg and Joan Eardley. Paul’s work show rich and colourful landscapes. 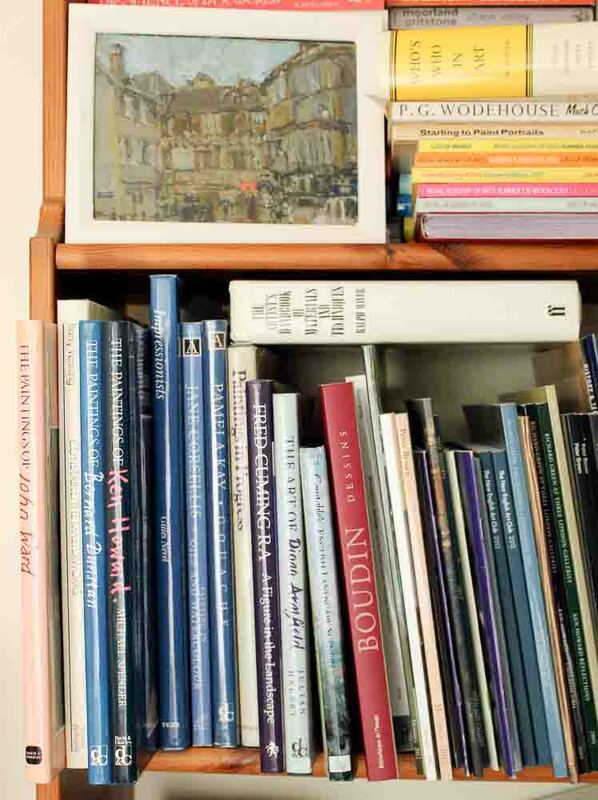 Sarah Jane Moon‘s shelf is bending under the weight of these heavy books on van Gogh, Jenny Saville, Uglow and Cezanne. I spot a book on drawing that looks similar to Hans Verbeek’s Dutch version. Bendy shelves is something all lovers of art books know only too well. 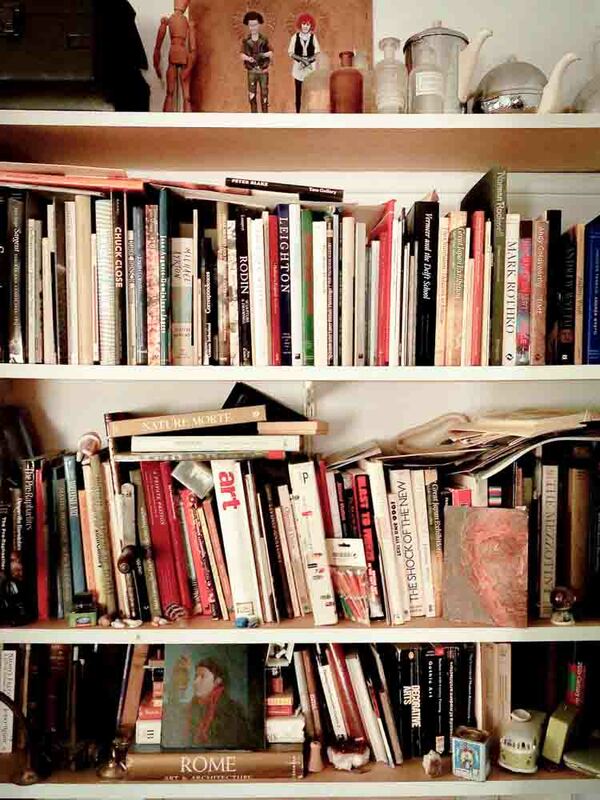 It is quite a task to find a bookcase that can take an art book collection. 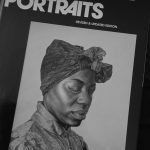 Her amazing portrait work speaks volumes (hah, excuse the pun) about her well-read background. 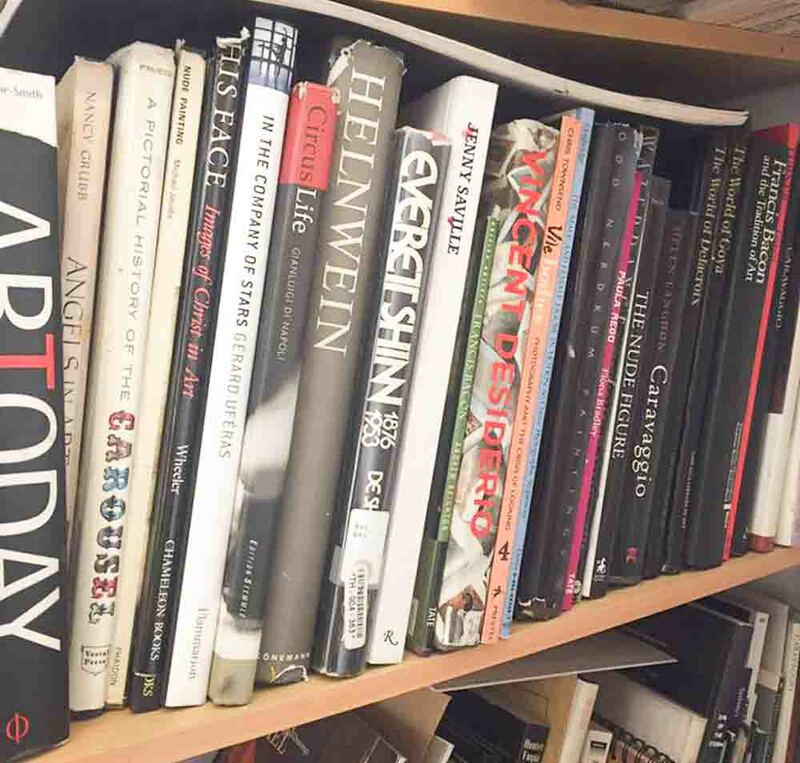 Hero Johnson’s book shelf shows a deep interest in art theory, portraiture and women in art. I love this shelf, partly because it shows in her work. There is Freud, Rembrandt and Rodin, but more interestingly, there is Linda Nochlin, there are titles like ‘Seeing Ourselves’, ‘Reading Women’ etc. ‘Holbein in England’ is still on my wish list. I’ll be googling some of the others. 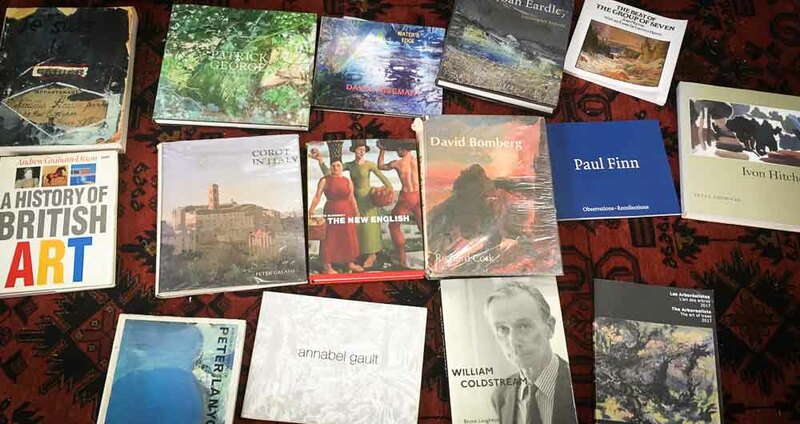 Gabrielle Roberts Dalton shows a huge collection of art history books ranging from Anglo-Saxon art to Durer, Bosch, Klimt and Max Ernst. It really covers all. Another picture she sent me showed some Paula Rego, paul Nash, Hockney and Freud. A truly wide interest, which I love. Gabrielle’s work is vibrant and lively, showing figures and portraits in complex psychological situations. David Gleeson‘s book case shows not just books but lots of fun and interesting bits and pieces for us to unashamedly nose over. There is a package of sorbet parasols (!? ), shells, a tea pot and some rock figures amongst the books. The topics of the books is very varied again. 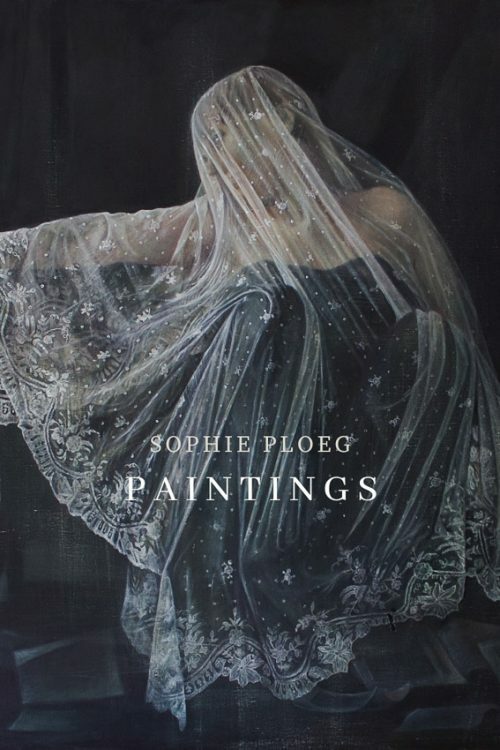 Lots of art history suchs as Vermeer, Rodin, Sargent and a book on Gothic Art. There is a book on drawings in the Royal Collection, some books on architectural history and one on mezzotints. Here and there are some paintings, leaning against the books. His work is exquisite and detailed, do have a look. My own book case shows mostly art history I think. I have books in various rooms in the house and this case is in my small studio. Books I am using or have newly bought go in here and when it is full I move stuff onwards to other book cases in the house. 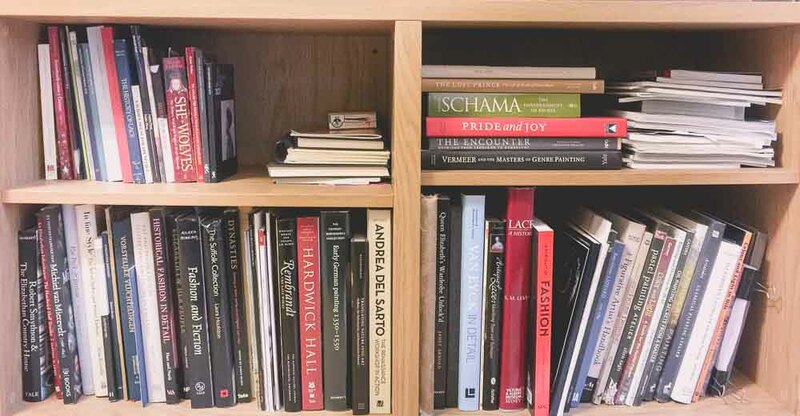 Of course there are books on the history of lace and fashion, there are some books on painting techniques, some books on Tudor architecture and many on 17th century Dutch art as well as the odd one on other art history topics. I hope you enjoyed this little peek in our book cases. It might help in understanding where we get our ideas and inspiration from, where we look when we get stuck or just want to relax. And it sure has given me some ideas for my next purchase! Thank you to my artist friends who were willing to share their book shelves!